Most of us face the same questions every day: What do I want? And how can I get it? How can I live more happily and work more efficiently? A worldwide bestseller, The Decision Book distils into a single volume the fifty best decision-making models used on MBA courses and elsewhere that will help you tackle these important questions. From the well known (the Eisenhower matrix for time management) to the less familiar but equally useful (the Swiss Cheese model). It will even show you how to remember everything you will have learned by the end of it. Stylish and compact, this little black book is a powerful asset. 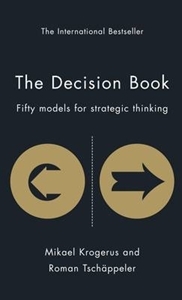 Whether you need to plot a presentation, assess someone's business idea or get to know yourself better, this unique guide will help you simplify any problem and take steps towards the right decision.